The Colton 37 inch vanity combo captures attention with its stunning Basil Green finish, brushed nickel hardware, and lovely louver doors. But Colton's construction is equally as compelling. Solid birch wood frame, dovetail joints, soft-close glides and hinges, plus flip-down drawers beneath the sinks means Colton delivers quality in both form and function. It also includes a carrera white marble top with rectangular undermount sink. Complete the look with matching mirror and linen tower. You cannot miss with Colton. Style. Function. Versatility. The 37-inch Brooks vanity combo will be the cornerstone of your bathroom, providing ample storage space in a compact design. Featuring a white finish and clean lines, the Brooks embraces a transitional aesthetic that is timeless and pure. The combo includes a durable carrera white marble top and oval white vitreous china sink. Add understated elegance to your bathroom with the Delano Collection. Spare in style, we designed Delano to accent a range of bathroom dicor, blending simple beauty with unmatched versatility. Whether you choose the Taupe Glaze or White Finish, the 30-inch Delano features a durable solid wood frame and sophisticated black bronze pulls, 1 flipped down DWR and 2 functional DWRs. The combo includes a durable carrera white marble top and rectangular white vitreous china sink. The Emma 31 inch vanity combo embraces purity of design and masterful construction. The vanity inWhite finish paired with black bronze hardware brings to life the cabinet's simple, clean lines. Emma provides abundant storage and Zen-like functionality. Soft-close glides and hinges keep things quiet and the solidwood frame and dovetail joints keep things strong. It includes a carrera white marble top and rectangular undermount sink. The collection also features complementary mirror and linen tower to expand the look. Emma makes your bathroom beautiful. Graceful lines and gorgeous details give the Giselle Collection an aesthetic you will not find in your average bathroom vanity. With matte gold hardware, a gleaming integrated arrara white marble top, and a stunning natural walnut finish, the Giselle 43 inch vanity combo commands attention without being ostentatious. An open shelf and roomy soft-close drawers deliver ample storage. Giselle transforms a blah bathroom into a luxurious spa. Pair it with the matching mirror to complete the look. 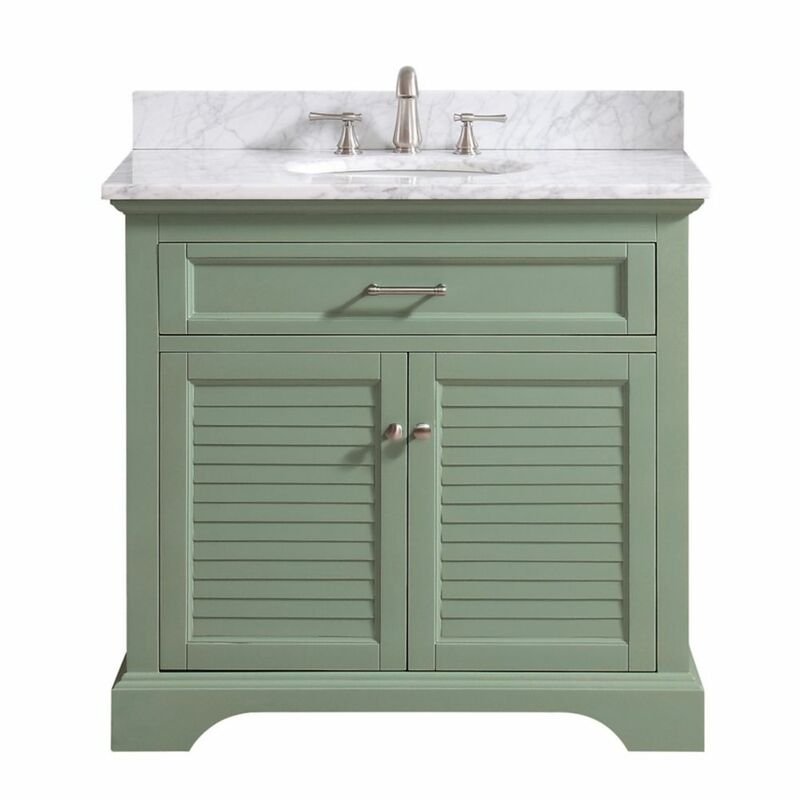 Colton 37 inch Vanity Combo Only in Basil Green with Carrera White Marble Top The Colton 37 inch vanity combo captures attention with its stunning Basil Green finish, brushed nickel hardware, and lovely louver doors. But Colton's construction is equally as compelling. Solid birch wood frame, dovetail joints, soft-close glides and hinges, plus flip-down drawers beneath the sinks means Colton delivers quality in both form and function. It also includes a carrera white marble top with rectangular undermount sink. Complete the look with matching mirror and linen tower. You cannot miss with Colton.